Some time during the three-plus years the Nintendo 3DS video game Luigi's Mansion: Dark Moon was in development, the game's main development team in Canada received a visit from Shigeru Miyamoto, the lead creator of The Legend of Zelda and Super Mario Bros..
Miyamoto, who works primarily out of Nintendo's headquarters in Kyoto, has famously high standards for the games he oversees. Japanese game developers at Nintendo with whom he works often joke about him metaphorically flipping over the table, urging big changes, en route to the creation of what tend to be well-made, highly-regarded games. As a result, Miyamoto is not just Nintendo's head of video game development; he's widely regarded as the top game developer in the world. In Vancouver, Miyamoto was meeting with the Canadian studio, an outfit called Next Level Games that has partnered with Nintendo on game development for about a decade, to check the progress on the Luigi's Mansion, which was then a primarily single-player game featuring Super Mario's brother, Luigi, tiptoeing through haunted locales, vacuuming ghosts. The Canadian team was dabbling with a multiplayer mode. "Miyamoto-san actually challenged us to say that this multiplayer will only be in the game if people will constantly play it, similar to Mario Kart," Next Level gameplay engineer Brian Davis recalled in an interview with Kotaku. Mario Kart is, of course, one of the most popular multiplayer video games of all time. Probably in the top five. Next Level director Bryce Holliday remembered the same conversation, as this kind of thing doesn't seem like a line you'd forget. He said they'd just shown Miyamoto a tech demo of multiplayer. "That was his response: 'Put it in the game if people can play it longer than they play Mario Kart.'" To most people, video game development is a black box. We play games. We enjoy them. We might notice credits rolling or logos on a DVD case, but game creators are mostly unseen. Their process is seldom exposed to the public. Even in the world of game development, among those who do know how games are made, Nintendo is its own blacker box of mystery. The Japanese firm is arguably one of the most secretive companies in all of entertainment and yet have also consistently produced excellent games longer than any other game company. Whatever mysteries they have must shroud very effective techniques. Earlier this week, I got a rare chance to peer inside, to explore Nintendo's process and try to figure out how they do what they do. I did this via an unusual trans-continental interview set up by Nintendo officials. Ostensibly, we'd be discussion Luigi's Mansion: Dark Moon, which is days away from reaching players' hands. But during our hour-long chat, we dug deeper than simple product hype. The top-left rectangle was a feed from Nintendo's Redwood City offices near San Francisco. Two public relations people sat closer to the camera. In the back were two of the Vancouver-based Next Level people working on the new Luigi game: Holliday on the left, Davis on the right. In the bottom-left rectangle were Yoshihito Ikebata, the supervisor for Luigi and Ryuichi Nakada, another supervisor who backed Ikebata up. Both men work out of Nintendo's Software Planning & Development Department and were sitting in a conference room in Nintendo's home offices in Kyoto, Japan. At least one other Nintendo official was off-camera. In the top-right rectangle was a translator and another member of the Nintendo team at the company's U.S. headquarters in Redmond, Washington. The translator, Jonathan Yeckley, would interpret my questions and the Next Level guy's answers for the Japanese developers and would translate what was said in Japan for the rest of us. We did this conference call at 8pm in New York. That made it 5pm in California and Washington; 8am the next day in Japan. I've interviewed Nintendo developers dozens of times, but usually in the same room at an E3 conference hall or in a hotel meeting suite. The translator is usually in the room with us—not that the likes of Miyamoto or Nintendo president Satoru Iwata always need them; they don't need English questions translated. Interviews through even the best translators are challenging. You ask a question. You are given an answer in a language you don't understand. You nod politely, try to react to tones of voice to convey interest. Then you listen to the English version of the answer, either looking at the translator (that feels wrong) or at the person who gave the answer but is no longer talking (that feels odd, too). It occurred to me, as I looked at the monitors showing people who work in three countries, that communication would be a huge challenge for people making games while an ocean and a language apart. And I realized, as we talked, that the kind of video conference we were doing was a big part of how these folks at Next Level and Nintendo made their Luigi games. But even this set-up didn't prepare me for some of the things these creators told me about their process. I was at times incredulous. I was intensely intrigued. Development of Luigi's Mansion: Dark Moon, a successor to the GameCube's Luigi's Mansion, started in 2009. The game runs on the Nintendo 3DS, which was announced in 2010 and released in 2011. When Next Level started making their 3DS game, they didn't know about the 3DS. "Nintendo usually keeps a lot of secrets," Holliday said. "Even being the developer, after learning about the project, we didn't know what we were building it for or on. We had to kind of envision what system this would be for. So we just started writing paper designs, researching the old game and coming up with new ideas. We pitched a detective game, and then we were working on a little Gauntlet-style paper design to kind of shift the series and then eventually we started getting more details from Nintendo about where they wanted to go with the framework." Developers do make games on hardware they haven't seen. Currently, game creators are making games for the PlayStation 4 without having any idea what that console will look like. They're making games for the next Xbox, too, using computers that match the specs of the planned hardware. But you'd think that, by the time a developer was making a game, they'd know what it was going to run on—especially if they were working with the people making the hardware. Not necessarily. Back in Japan at that time, the Nintendo folks had a clearer idea of what the game would be for. They were aware of the 3DS project and had decided that a new Luigi's Mansion game could be a good fit for it. They also thought that Next Level Games, which had made two Mario soccer games and a long-awaited sequel to the classic Nintendo game Punch-Out under Nintendo's supervision, would be good for the Luigi project. So they phoned Next Level and got them on a video conference. Holliday remembered that video call. "We were developing something in secret, like we usually do working with Nintendo," he said. "There was a conference call very similar to this one where it was kind of announced to us that we would stop working on what we were currently doing and start—they even added a little drum roll—to work on Luigi's Mansion." He clarified that, yes, Kensuke Tanabe, the long-time Nintendo producer who also worked with the Japanese company's in-house Texas-based studio on their Metroid and Donkey Kong games, did some rapid hand-tapping on the table. "Tanabe-san is a funny guy, and he was trying to get me excited for this bad news," Holliday joked. Nintendo has been making video games and hardware for a few decades, so making a sequel to one of the company's games involves an intersection with roads paved a long time ago. 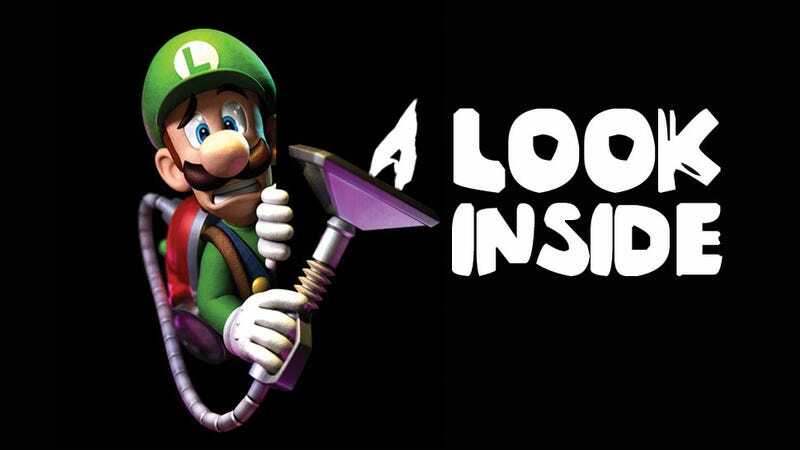 That first Luigi's Mansion was a launch game for the GameCube in late 2001, meaning it had been in development for perhaps even a decade before Next Level was assigned to the new game. Players of the first Luigi's Mansion had experienced a single-player game about Luigi trying to catch ghosts that made for normal TV screens. Internally, however, Nintendo had dabbled with a multiplayer mode and had also tried making the game run in 3D. "The original GameCube director, Konno-san, explained what the 3D tests looked like using the GameCube hardware," Holliday said, recalling a few more video conference calls. "I believe there were some problems with 3D viewing technology then, so they didn't keep working on it. But through that explanation we kind of reverse-engineered what the idea was. The first concept to come out was just using a dollhouse perspective, which is the camera kind of static on one side to just have Luigi running around in an environment to see how it would stand out in 3D. And we proceeded to [make] a tech demo and then a full on demo after that." According to Ikebata, the new game's multiplayer also had a precedent. "In the development of the first game there were actually [multiplayer] experiments done on the GameCube. Actually, Mr. Miyamoto had very positive impressions with how it worked but for various reasons it didn't make it into the game. So when the development of this game started out, the director of the original game, Mr. Konno, had very strong feelings about definitely including multiplayer in this title. So multiplayer was a decision that was made from the very beginning of development." Your Characters Will Have Rules. You Can Try To Bend Them. Getting assigned to make the new Punch-Out is a sign of trust from Nintendo. They don't farm out their famous franchises to just anyone. But Punch-Out is an easy hand-out next to a game starring the most famous second-fiddle in video games. Next Level got Luigi. That was big. But Luigi comes with rules. It turns out that Nintendo characters often do. One rule for Luigi for the new game? Luigi wasn't allowed to jump. In Super Mario Bros., that's fine. In a Luigi's Mansion? It was not permitted. "That comes from NCL," Davis said, referring to Nintendo by the acronym for their Japanese HQ. "We have a set of rules that we can explore within each character. Different characters like Toad we were restricted on. Well, he can only do certain things in the game. [For example,] he's supposed to look like he's having fun when he's with Luigi. There are situations in the game where, if he's not connected with Luigi, we try to make him look scared or frightened, so that the player feels an emotional connection with him when you leave him." "Ikebata-san and Nakada-san kind of the gatekeepers of the rules of the game and of the [intellectual property]," Holliday added. "Then we push the boundaries through concepts and proof of concepts and then they'll keep bringing us back. So we're kind of given creative freedom to explore within the framework and test the boundaries—and they're kind of the ones who always bring it back and keep it cohesive." Ikebata-san and Nakada-san were on our video conference, so I asked them where the no-jumping rule came from. "As for why Luigi can't jump, that's simply a carry-over from the game design that was established in the GameCube version," Ikebata said. "But as to why in the GameCube version Luigi wasn't able to jump, unfortunately I'm not able to answer that." He was at least able to make a sensible, educated guess. "Luigi's Mansion [Dark Moon] is not so much an action game as it is an adventure game. With the limitation on jump, it helps stress the adventure elements of the game. And I imagine that the same reasoning went into the design decision to not let Luigi jump in the original Luigi's Mansion." A lot of game studios make games in a year or, ideally, in two. Three's less common. More than three? That's exceptional. Luigi's Mansion: Dark Moon extended past three. That's a luxury and it's also a sign, apparently, of some high standards. "The game started out on a new system, so first there was technical [matters] of just getting everything running," Holliday said. "And then we were working with Miyamoto directly, which came with its own differences from earlier groups, which were a little bit more third-party. We were getting a little bit closer into the family, and that provided some different relationship-building that we needed to do and different kind of characteristics that we weren't quite used to. "Then the game was about adding value. Because the first game was notoriously short. And Miyamoto himself would play the game even a year into development and say, 'No we need to keep adding more. Let's keep experimenting with new gameplay ideas.' So [there was] almost 16, 18 months of, I would say, prototyping phases of just let's just try a slide game, let's try ballooning, let's try different things with the vacuum. We threw away a lot, maybe enough to make another game, but it's that kind of commitment to experimenting that was trying to satisfy his need to add a lot of value to the game. And I think the multiplayer eventually ended up being that value-add component." "As we were experimenting, we had all the different mansions," Davis added, "and we wanted to make sure that all the mansions were up to a certain level of quality as well. That obviously takes a bit of extra time to do." Nakada admitted that he thought the game was finished multiple times. "Throughout the three-year development time there were a number of points where we stopped and were like, 'Well, we're done. This is good to go.' But there were places that we found that were good enough that we actually wanted to take advantage of them a bit more and expand upon those discoveries throughout the development. So that's another factor as to why it took three years." You'll Get Affirmation. But It Won't Always Be Verbal. Make a game with Nintendo and you can hope that you'll finish up with something that's, at worst, good and is, ideally, exceptional. The proof is in the playing, but there are other ways to find out, too. If you're the Next Level guys, you can go to E3 and watch some Nintendo people from Japan play your game and see how they react. That happened last year. The Nintendo people didn't have a translator, Davis said, "but we could tell they enjoyed the game by watching them." Then the NCL people started making gestures like they were casting a fishing line and reeling it back in. This was encouraging given that, according to Davis and Holliday, the original Luigi's Mansion was originally going to be a fishing game. Playing a Luigis Mansion was supposed to feel like fishing. The NCL folks were casting out and reeling in their ghosts. They were having a good time, Davis remembered. "They gave us the thumbs up." Luigi's Mansion: Dark Moon will be released later this month on the Nintendo 3DS. It was made by Next Level Games and Nintendo. It includes a single-player adventure and multiplayer. That multiplayer is supposed to be good. Miyamoto said so.